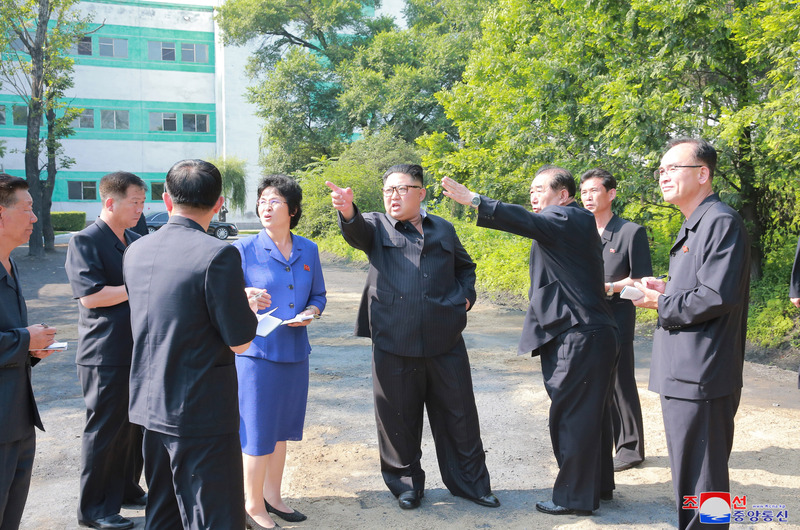 WPK Vice Chairman An Jong Su (foreground, 2nd from the right) briefs Kim Jong Un on the layout of the Sinu’iju Textile Mill (Photo: Rodong Sinmun). 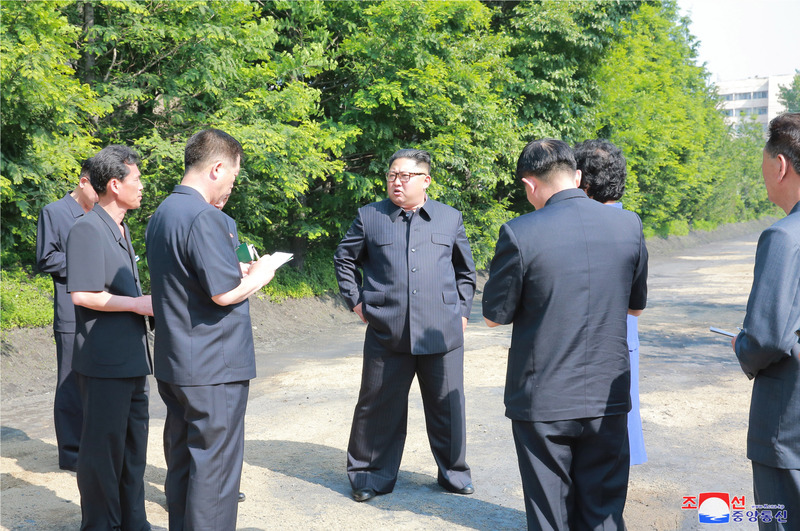 DPRK state media reported on July 2 (Monday) that Kim Jong Un (Kim Cho’ng-u’n) provided on-the-spot guidance to the Sinu’iju Textile Mill and the Sinu’iju Chemical Fiber Mill. Also in attendance were Workers’ Party of Korea (WPK) Vice Chairman and WPK Light Industry Department Director An Jong Su (An Cho’ng-su), senior WPK Central Committee cadres Hwang Pyong So (Hwang Pyo’ng-so’), Han Kwang Sang (Han Kwang-sang), O Il Jong (O Il-cho’ng), Kim Song Nam (Kim So’ng-nam) and Hwang Yong Chol (Hwang Yo’ng-ch’o’l) and leading functionaries of the Personal Secretariat Kim Chang Son (Kim Ch’ang-son) and Jo Yong Won (Cho Yo’ng-wo’n). Overview of where the mills are located in Sinu’iju (Photo: 38 North DPRK Digital Atlas, Google image). 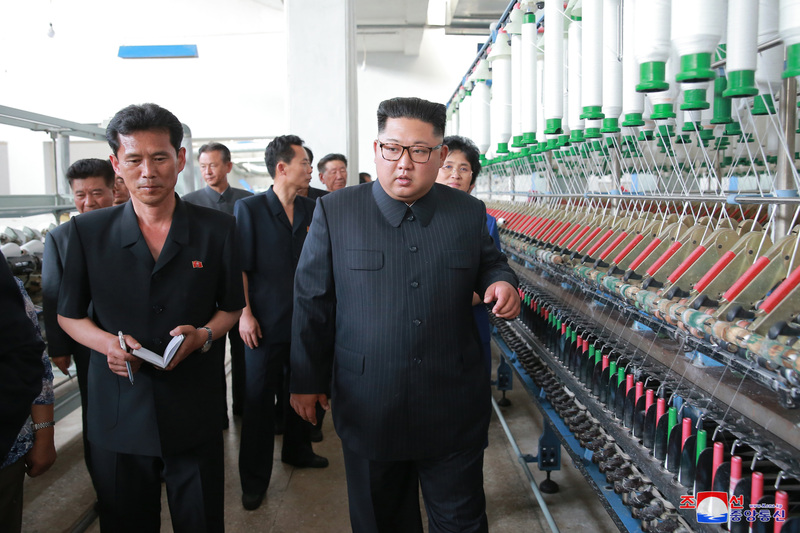 Kim Jong Un is briefed about the Sinu’iju Textile Mill (Photo: KCNA/KNS). 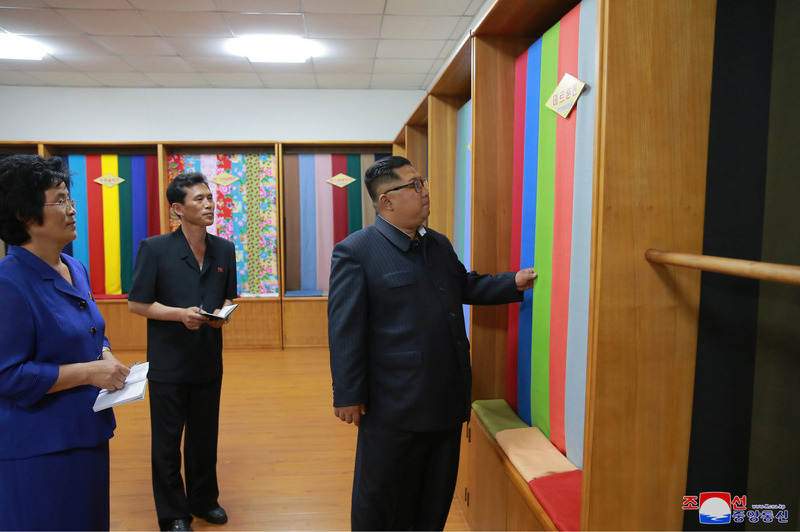 Kim Jong Un reviews products of the Sinu’iju Textile Mill (Photo: Rodong Sinmun/KCNA). 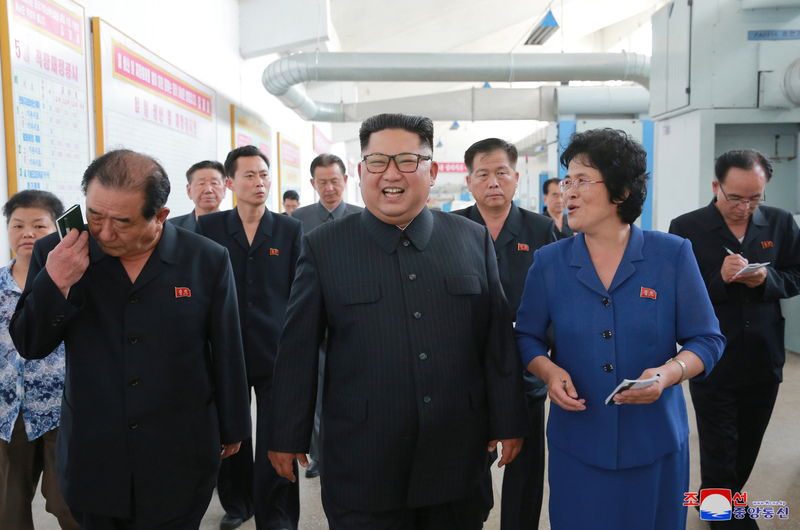 Kim Jong Un smiles whilst being briefed about production at Sinu’iju Textile Mill (Photo: KCNA/Rodong Sinmun). 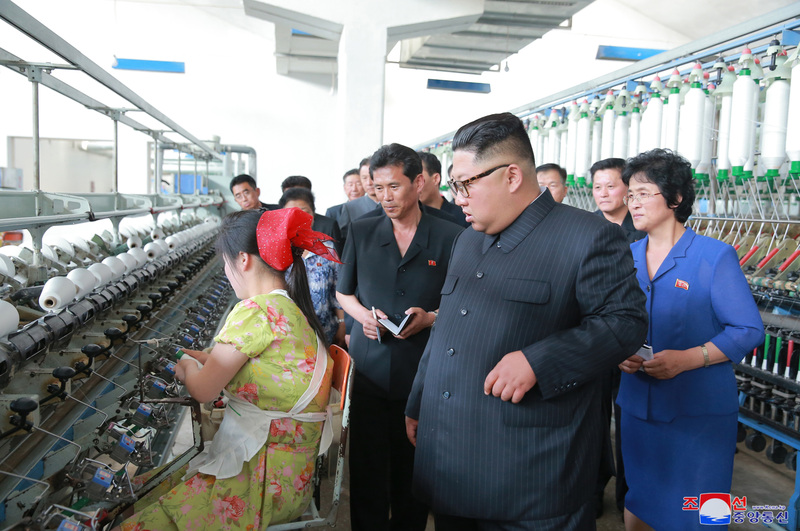 Kim Jong Un examines a spindle machine at Sinu’iju Textile Mill (Photo: KCNA). 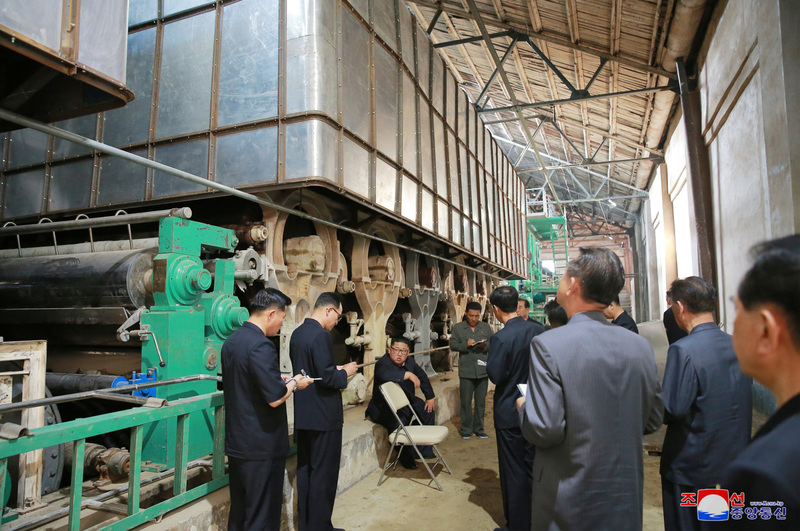 Kim Jong Un inspects machinery at Sinu’iju Textile Mill (Photo: KCNA). 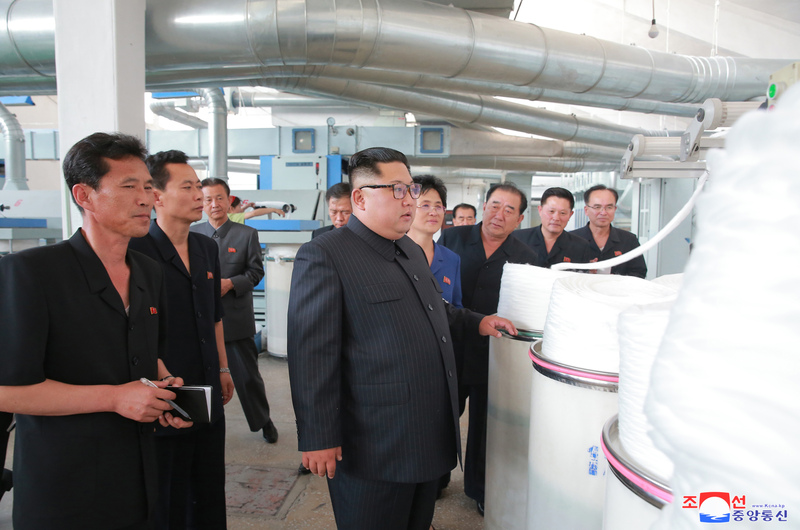 Kim Jong Un tours a a unit of the Sinu’iju Textile Mill (Photo: Rodong Sinmun). Kim Jong Un talks with a leading official of the Sinu’iju Textile Mill (Photo: KCNA). 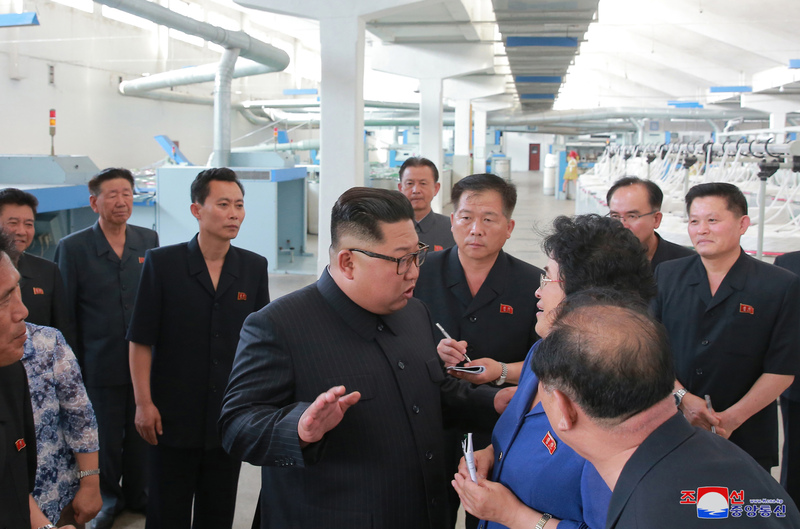 Kim Jong Un is briefed about material production at Sinu’iju Textile Mill (Photo: KCNA/Rodong Sinmun). 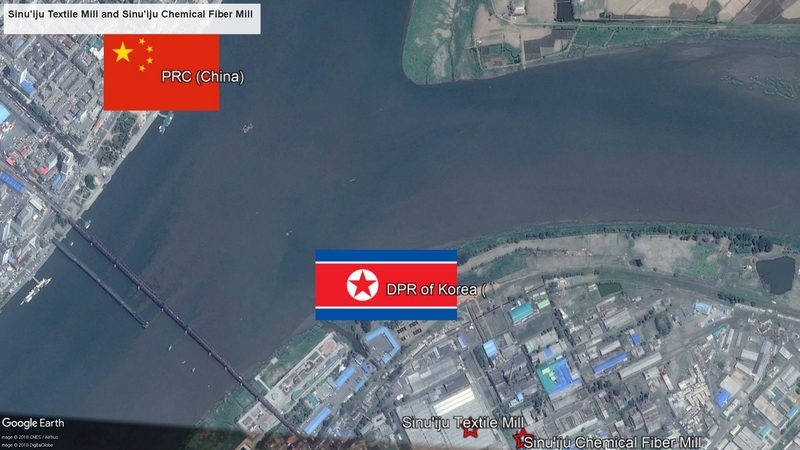 View of the location of Sinu’iju Textile Mill and Sinu’iju Chemical Fiber Mill (Photo: 38North DPRK Digital Atlas, Google image). 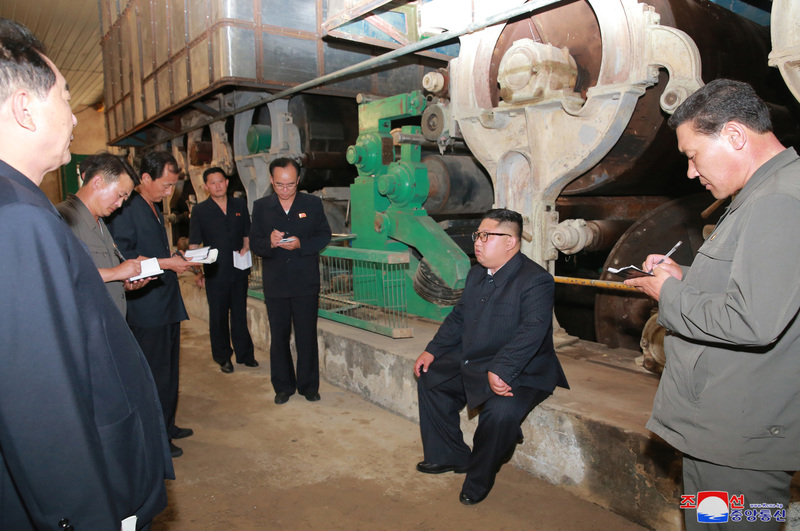 Kim Jong Un smokes a cigarette and talks to factory management during his visit to Sinu’iju Chemical Fiber Mill (Photo: Rodong Sinmun). 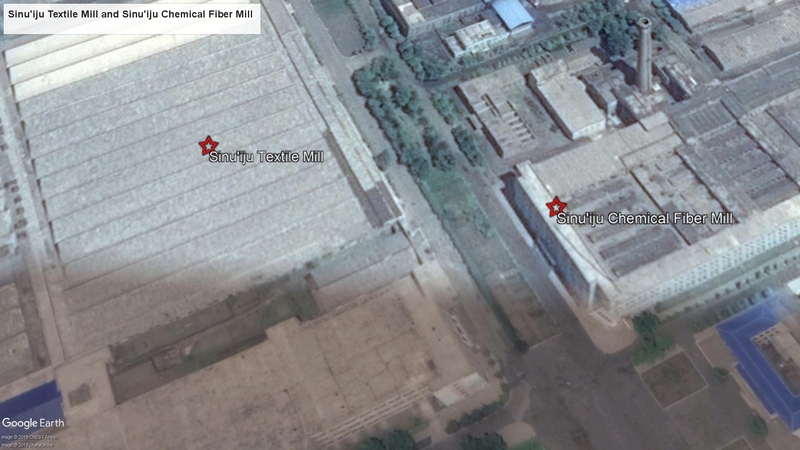 Jong Un also provided an on-the-spot inspection of Sinu’iju Chemical Fiber Mill. He began his visit at its revolutionary history education room and was briefed about mill’s production at its paper manufacturing workshop. 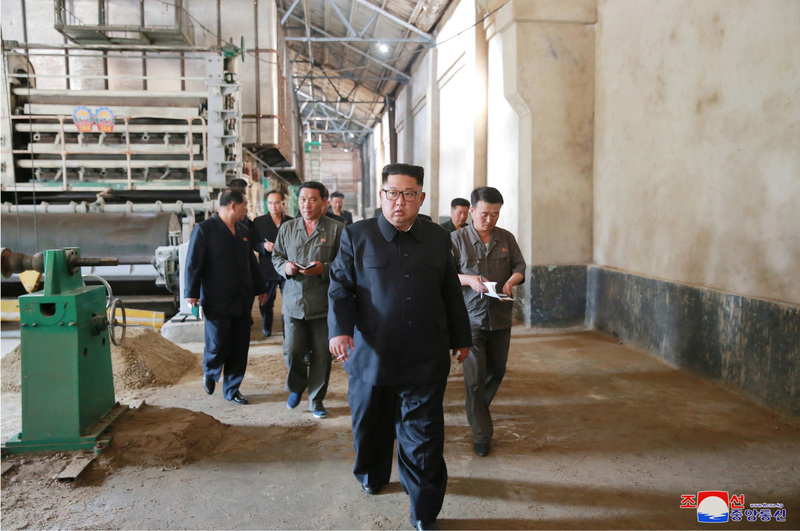 Kim Jong Un walks through the Sinu’iju Chemical Fiber Mill (Photo: KCNA). 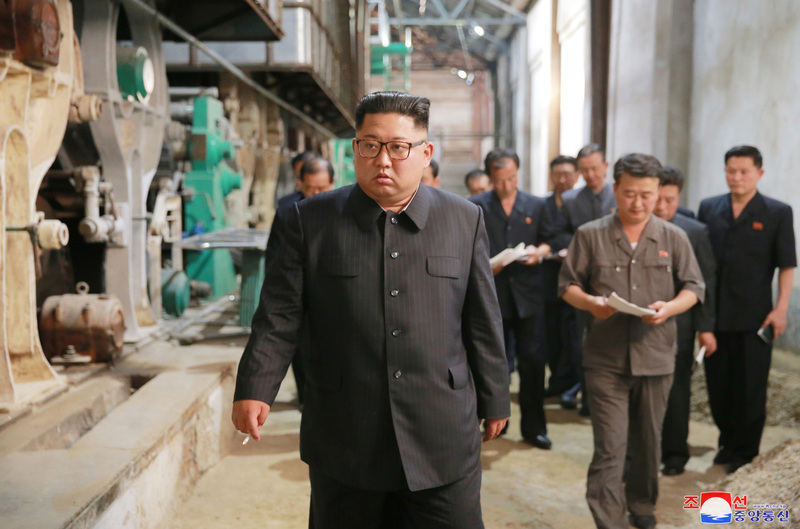 Kim Jong Un hold a cigarettes whilst walking through Sinu’iju Chemical Fiber Mill (Photo: Rodong Sinmun/KCNA). 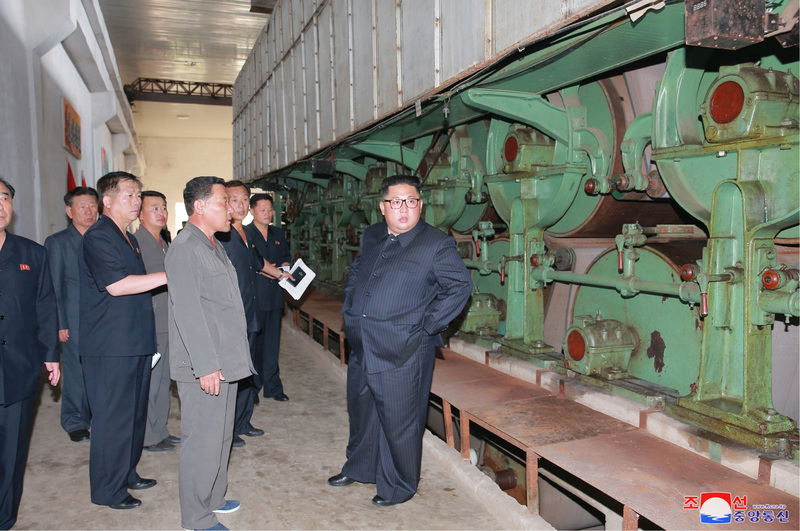 Kim Jong Un is briefed about manufacturing equipment at Sinu’iju Chemical Fiber Mill (Photo: Rodong Sinmun/KCNA). 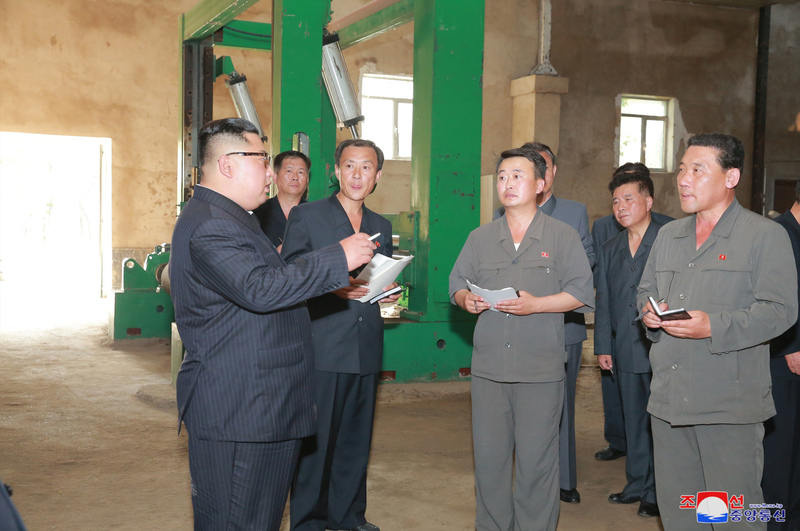 Kim Jong Un discusses industrial upgrades at Sinu’iju Chemical Fiber Mill (Photo: KCNA). 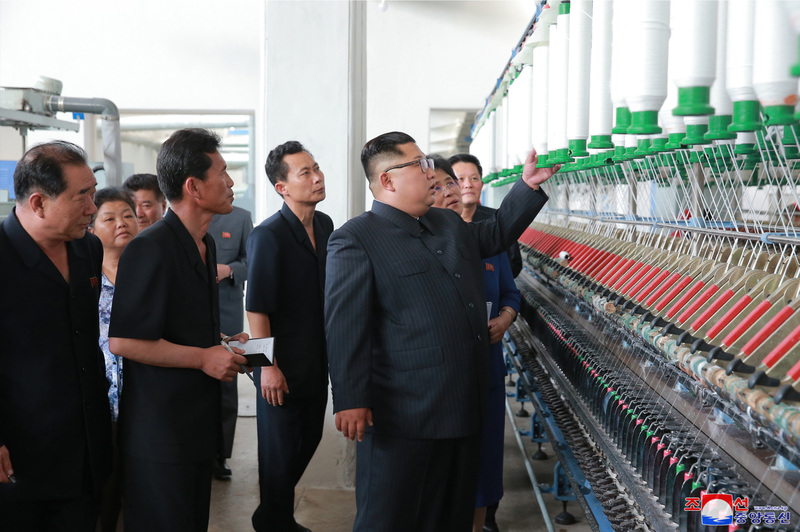 Kim Jong Un inspects Sinu’iju Chemical Fiber Mill (Photo: KCNA/Rodong Sinmun). 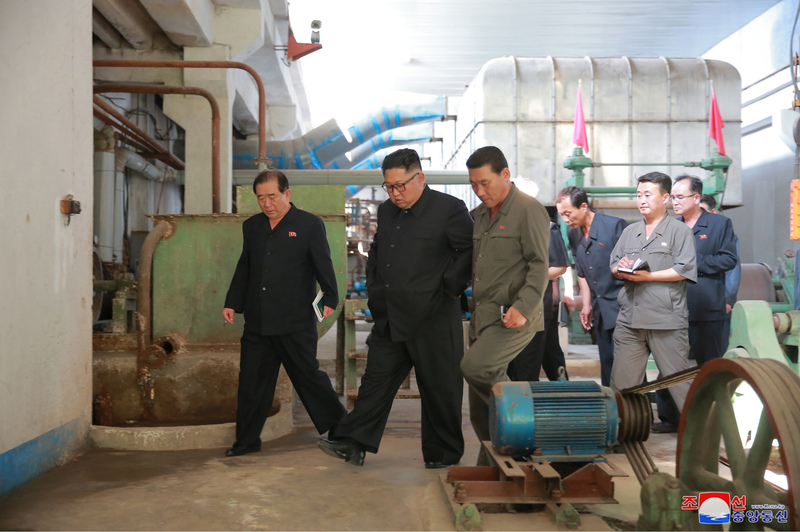 Kim Jong Un examines manufacturing equipment at Sinu’iju Chemical Fiber Factory (Photo: KCNA). 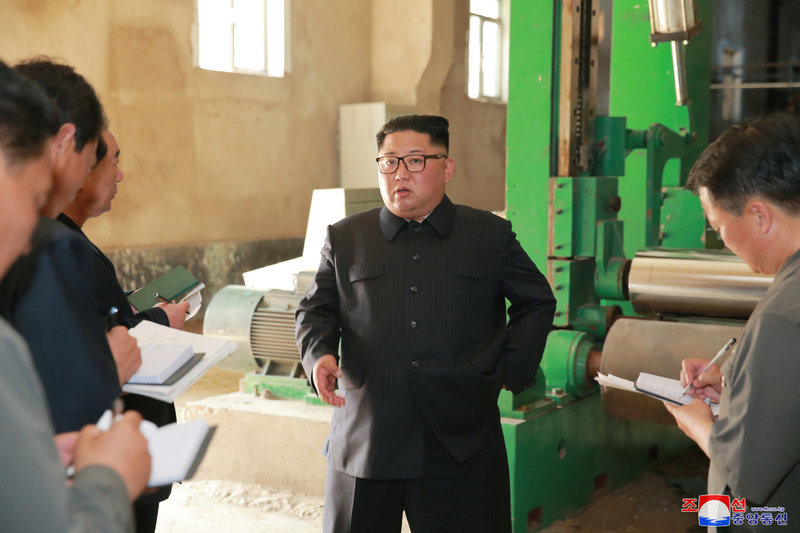 Kim Jong Un during his visit to Sinu’iju Chemical Fiber Mill (Photo: Rodong Sinmun). 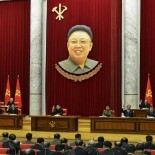 This article was written on 02 Jul 2018, and is filled under An Jong Su (WPK LID), basic party organizations, Central Committee, Central Military Committee, chemical facilities, Col. Gen. O Il Jong, Comprehensive Affairs, cpc-kwp rels, critical infrastructure, DPRK Cabinet, DPRK-China Joint Guidance Committee, DPRK-China Relations, Economic Complexes, Events Management Section, Executive Policy Bureau, Finance and Accounting, Financial Planning Department, Five Year Economic Plan and Development Strategy (2016), General Affairs, Guard Command, Han Kwang Sang, Hwang Pyong So, Hwang Yong Chol (WPK CC DD), International Affairs Department WPK, International Department, Jo Yong Won, Kim Chang Son, Kim Chong-un inspections, Kim Family, Kim Jong Un Visits, Kim Jong-il, Kim Jong-un, Kim Song Nam (IAD), KJI Personal Secretariat, KJI/KJU Ideological Works, Korean People's Internal Security Forces, Korean People's Army (KPA), Korean Workers' Party (KWP), KPA construction battalions, KPA construction brigades, KPA General Logistics Department, kpif, Light Industry Department, Local Party Affairs, local people's committees, Main Office of Adjutants (Central Party Office #6), Ministry of Construction and Building Materials Industry, Ministry of Foodstuffs and Daily Necessities, Ministry of Light Industry, ministry of people's security, Ministry of State Construction Control, Ministry of State Security, Ministry of the People's Armed Forces (MPAF), North Korean press, North Pyongan KWP Provincial Committee, North Pyongan Provincial People's Committee, Notification, On the Spot Guidance, Organization and Guidance Department, PAD Guidance Section, party life, Party Life Guidance, Political Bureau, primary party committees, Propaganda and Agitation Department, Provincial Party Committees, Provincial Party System, Provinicial People's Committee, Public Information Commission, Secretariat, State Affairs Commission, State Planning Commission (SPC), State Security Department, Uncategorized, water facilities, WPK Economic Affairs Dept.